On Thursday, Sánchez signaled in a television interview that the generational rift remains. Pressed to clarify her comments, Sánchez went further and said House Minority Whip Steny H. Hoyer (Md.) and House Assistant Minority Leader James E. Clyburn (S.C.), who have been part of Pelosi’s leadership team for more than a decade, also should prepare to step down. “They are all of the same generation, and, again, their contributions to the Congress and the caucus are substantial. But I think there comes a time when you need to pass that torch. And I think it’s time,” she said. Sánchez said that the leadership change did not need to happen immediately but by after next year’s elections. The 48-year-old lawmaker also stressed that her concerns were about seniority. “This is not an age thing,” she said. Yeah, that’s the issue with Nancy. She’s been promising to retake the House ever since the 2010 Tea Party wave and has failed to do so. Yes, part of that is to say such things to rally the troops, but when you become foil for the opposing party—maybe it’s time to consider making your exit. 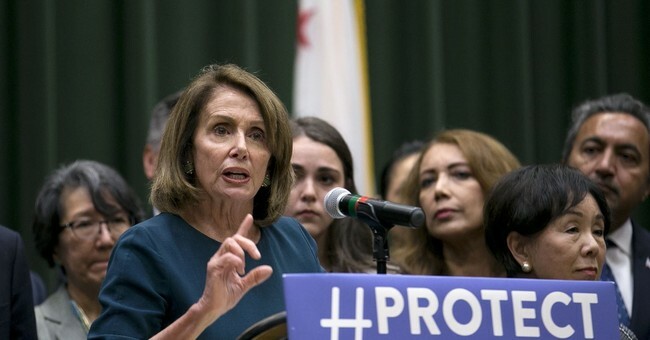 Rep. Tim Ryan (D-OH) also noted after the special election in Georgia’s sixth congressional district, the most expensive in U.S. history, that Pelosi is viewed as more toxic in some parts of the country than Donald Trump. Moreover, this could have been a motivating factor in what pushed Republican Karen Handel over Jon Ossoff. That and GA-06 is a Republican district; one that Democrats thought they had a chance at since these voters aren’t too keen on Trump. To complicate matters for Pelosi, the road to the majority rests through districts, like GA-06, that are not liberal but right leaning. And a strong Democratic turnout might not be enough to win, as we saw in Georgia, which was at its highest in ten years. There are also not enough suburban districts to retake the majority, and every district is not homogenous. Nate Cohn over at The New York Times certainly writes that Democrats have the chance to flip some seats, maybe even enough to retake the majority, but it could also very well be an electorate that mirrors 2016, in which the GOP will be safe. Democrats already lost one recruit, Erin Cole, to challenge Republican Rep. Chris Collins in NY-27 after it was determined by donors that she probably couldn’t win, despite it being a top target for the Democratic Congressional Campaign Committee. Even if Democrats were able to turn out every Clinton voter in 2016 who voted Republican down ticket and had them flip next year—it wouldn’t be enough to retake the House. That’s a punch to the gut right there. Since Pelosi has remained, Democrats have become a more progressive party, but also a more regional and coastal one. That does not bode well for winning national elections and contrary to popular opinion, cities are not where most Americans live. Only 15 percent of the total U.S. populations live in the top 50 cities in the country. That’s not a winning strategy. And since Pelosi, the party has experienced a total collapse in its power. Democrats are in their worst shape since the 1920s, whereas Republicans control the House, Senate, White House, 69/99 state legislatures, and two-thirds of the governorships. Nancy has been bad for the party, which is precisely why I want her to stay right where she is in the House Democratic leadership.